Are you looking for a natural digestive health supplement that is a convenient, flavourless source of prebiotic fiber? MSPrebiotic (the best prebiotic supplement) is a digestion resistant starch that is carefully extracted from potatoes delivering several prebiotic benefits: the growth of healthy bacteria in the gut microbiome, improved digestion, supports regularity and a untapped energy boost. A single prebiotic fiber from a familiar source delivering benefits you didn’t expect. Our colons are the ideal environment for these beneficial bacteria to grow and thrive. But like a garden or lawn left without water or fertilizer, our gut and the microbiome inside can also be neglected. This allows harmful bacteria to take a foothold, leading to Dysbiosis and causing a plethora of problems. Sadly, the risk of developing Dysbiosis increases as we age. Fortunately, it is easy to keep your gut microbiome happy and to prevent or reverse Dysbiosis – by supplementing your diet with prebiotics. 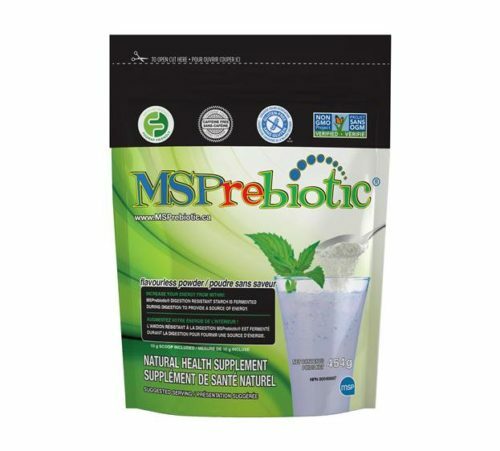 MSPrebiotic® replenishes the body by renewing the healthy microflora in the digestive tract. As healthy microflora feed on MSPrebiotic®, they replicate and increase in numbers, crowding out harmful bacteria while conferring numerous health benefits. This product has been clinically shown to reverse age-related changes in the gut microflora, thereby returning this ecosystem to one more typical of a healthy, younger individual. Modern diets lack the Recommended Daily amount (RDA) of dietary fibre, which is associated with the development of serious diseases. In fact, most people ingest only 3 to 8g of fibre per day, which is largely due to the consumption of convenient but highly-processed foods. MSPrebiotic comes in a flavourless powder form and can also be easily added to smoothies, shakes, or yogurt – the choice is up to you!